The Ten Worst Governors for Education……And We Have One of Them. 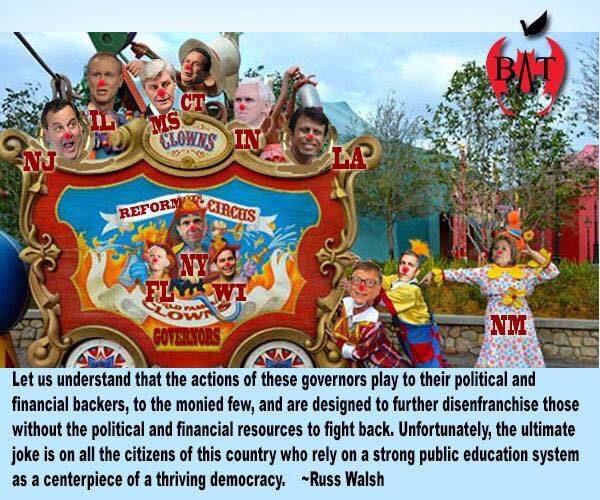 The following list of governors who have negatively influenced public education in their states was compiled by Russ Walsh, an experienced curriculum director in school districts in New Jersey and Pennsylvania. Our governor, Dan Malloy, is on the Top Ten list of offenders, but Governor Malloy is ranked number 10. I am sure, to the dismay of many in Connecticut, if this list had been written today, our governor could earn a much, much higher spot. Surely, he could place at #3 or maybe even at #2. His new attacks on public education include taking $17.1 million out of traditional public schools, which will curtail extended day and summer programs in needy school districts, make universal preschool impossible, not fund priority districts as promised and at less than last year, and limit aid for transportation of students. At the same time, his budget will spend $12.4 million to build two new charter schools in cities that voted against them and add 700 new seats in existing charter schools. In addition as the legislative session was coming to close the first week of June, Governor Malloy tried to pull a fast and sneaky trick on the legislature by switching language on a bill that the legislature had almost unanimously passed a few days earlier. The bill gave the authority to approve charter schools to the state legislature instead of keeping it in the hands of the officials at State Board of Education, who are appointed by the governor, and would make charter schools responsible under the Freedom of Information laws to disclose the same information as all other publicly funded entities. The governor tried to change those two provisions in the bill that the legislature had just passed without telling the legislators. Now that I think of it, I say that we have a governor who definitely ranks #1 in the destruction of public education. Now that David Letterman has exited stage left, taking his Top Ten Lists and Stupid Pet Tricks with him, Russ on Reading is ready to step into the void by highlighting a new bunch of clowns for your diversion. Inspired by the incredible stone-headedness of this nation’s governors when it comes to education, I call my new list Top Ten Stupid Governors Education Tricks. Since education policy supposedly lies with the states in this country (unless you are accepting bribes in the form of stimulus money from the federal Department of Education), governors hold a great deal of power when it comes to education policy and budgets. Many governors have fallen in love with the false promises and faulty reasoning of the corporate education reformers (possibly because these reformers fill their campaign coffers) and have done some supremely stupid things. The list below only scratches the surface. Please feel free to add your own stupid governor’s tricks to the list. 10. Connecticut Governor Dannel Malloy – While most governors on this list are Republicans, Democrat Malloy shows that Republicans don’t have a monopoly on gubernatorial stupidity. In his 2012 State of the State address, after riding teacher union support to an electoral victory, Malloy said, “In today’s [education] system, basically all you have to do is show up for four years. Do that and you have a job for life.” Malloy then introduced a bill to do away with tenure. Malloy has been backpedaling from this stupid trick ever since, finally pressuring his reformy Education Commisioner, Stefan Pryor, out in a deal with the Connecticut Education Association last year. But you need to ask, “On what planet do you get better education performance from students by denigrating the people who are working closely with those students every day?” See? Just stupid. 9. Illinois Governor Bruce Rauner – Rauner is so reformy that he has a charter school named after him. He has given millions to charter schools in Chicago. In an exchange with charter critic Diane Ravitch, Rauner said that his charters don’t need to apologize for not accepting second language learners and children with disabilities, because they only want families who are highly motivated. For Rauner “school choice” apparently means only educating children that charters choose to educate. He is a champion of the dual system of education, one for the haves and another that none of his cronies cares about or supports for the have-nots. 8. New Jersey Governor Chris Christie – Chris Christie is running so hard for president that he is laying waste to the state he was actually elected to govern. On education he has flip-flopped more than a stranded whale on a New Jersey beach. Christie has read the conservative political waters of the nation and has suddenly discovered that the Common Core State Standards, which he has long championed, now represent federal overreach. Compounding his stupidity is that the governor has called for new “New Jersey” standards, but will keep the Common Core aligned PARCC test in place. So, let’s change the standards, but not the test that measures the learning of those standards. This leaves New Jersey’s school children and teachers further confused about what to study and how to prepare. In any test of accountability in public office, Christie can only be pronounced “not proficient”. 7. Louisiana Governor Bobby Jindal – Like Christie, Jindal loved him some Common Core until he decided to run for president. But this flip-flop added an extra measure of stupidity by generating a legal battle between Louisiana Schools Superintendent John White, who continued to support the Core and Jindal, who needed to distance himself from the Core to appeal to the conservative Republican base. White actually sued and won a court battle over the Common Core against Jindal. Louisiana blogger Mercedes Schneider writes that Jindal’s legal team failed to provide a strong case. This is the second high profile court case related to education Jindal has lost (He lost an earlier federal case that vacated his voucher program). Jindal has argued that teachers do not need training in education to be effective teachers. Perhaps Jindal hires lawyers without legal training as well. 6. Mississippi Governor Phil Bryant – Governor Bryant flunked third grade when he was 9 years-old because he couldn’t read well. Bryant believes that this was really good for him and so he has decided to share this good fortune with about 6,000 current Mississippi third graders who “failed” a state literacy test. Apparently, Bryant’s literacy education was not sufficient to allow him to read and comprehend the tons of research that demonstrates how retention is bad for children in myriad ways and often leads to students dropping out. I wrote more about this child abuse here, but for perpetrating this stupid education trick let us hope that Bryant is not “retained” as governor in the next election. 5. Indiana Governor Mike Pence – Republican Mike Pence came into office in 2012 hoping to continue the destruction of public education begun by his predecessor Mitch Daniels. Unfortunately for Pence, on the same election night when Pence was elected, the people of Indiana also elected a new Superintendent of Public Instruction, Glenda Ritz. Ritz was voted in as a rebuke to the reformy policies of former Superintendent Tony Bennett (not the one who left his heart in San Francisco), so Pence was faced with a quandary: How to continue the reformy agenda with an actual public school teacher and advocate for public education in office as the schools superintendent. Pence hit on a plan that earns him a special place on this list. He decided to ignore the democratically elected Ritz and strip her of any power. His message: Democracy be damned, I gotta’ deliver school choice for my wealthy cronies.Pence managed most of this with the aid of a heavily Republican legislature, but Ritz may have the last laugh. She recently announced she is running for governor. In the last election, she polled more votes than Pence. We can only hope that happens again in 2016. Read more about Pence’s stupid education tricks here. 3. Florida Governor Rick Scott – Like the other reform governors here, Florida’s Rick Scott loves charter schools, vouchers, union bashing and everything else designed to destroy public education and turn it over to the privatizers. Scott makes this list though because about three years ago he discovered that Florida might be giving too many tests. Nothing much happened about this discovery until this year, where, after apparently three years of study of the problem, Scott signed a bill eliminating exactly one test, an 11th grade language arts exam. I am sure that makes the 3rd graders in Florida feel better. Of course, these kids should all feel better because now they can only be tested for 45 hours a school year or the equivalent of non-stop testing for two weeks a year. Gee, thanks, Guv. 2. New Mexico Governor Susana Martinez – Martinez earned her way onto this list with one of the more telling stupid governor’s tricks. During her campaign she was caught on tape denigrating women, political opponents, and teachers in a profanity laced campaign meeting. Specifically, Martinez said that she could not understand what teachers were complaining about since they “don’t work you know two-and-a-half months out of the year, three months out of the year.” Unsurprisingly, a person with such a low regard for teachers has bought in to the entire corporate education reform agenda of test based accountability and choice. When her uncensored remarks were made public, her advisors tried to laugh it off as Susana being Susana, but the teachers and children of New Mexico are not laughing. 1. New York Governor Andrew Cuomo – And the number one prize for Stupid Governor Tricks can go to none other than that champion of educational obtuseness, Andrew Cuomo. In December 2014, Cuomo vetoed his own bill that placed a two year moratorium on the use of test scores in teacher evaluations. Apparently, Merry Andrew was miffed that teachers scored well on their 2014 evaluations, and he would have none of that. Against any and all factual information at hand, Cuomo then decreed that 50% of the teacher evaluation would be based on test scores. If these bogus “value added measures” show the teacher to be ineffective, the teacher cannot get an effective rating, no matter what observational data says. Other provisions rule out the following as part of the evaluation: student work portfolios, student or parent surveys, and professional goal setting documents. Andrew Cuomo truly believes that teachers are to blame for student failure and by gum, he is going to find an evaluation scheme to prove he is right, no matter what damage it does to teachers, children, and public education in New York.